So you’ve hit the beach, the lake or riverbank and you’re ready to take to the water. Or perhaps you’re heading out on a hike or hitting the trails on your mountain bike. No matter what the activity, having the right gear will not only make your experience as enjoyable as possible but will also take your performance to the next level and keep you safe whilst doing it. These are our top kit recommendations of things you really need, and due to our functional design approach, you’ll find them invaluable for any water sports or outdoor adventure. Enhancing performance whilst looking stylish has never been so simple. Whatever the activity, whether it’s paddle boarding, running, cycling, sailing, yoga or even rugby, being comfortable will help you enjoy it more. And a lot of this comfort comes from being the right temperature! Our technical performance t-shirt will help keep you cool whilst exercising, thanks to its Dri-Release technology which wicks away the sweat, and also dries quickly, making sure you stay comfortable. It also works well as a base layer on those chillier days. What’s more, your movement won’t be restricted thanks to the slight stretch in the fabric, designed to move with you as you exercise. On slightly cooler days, opt for a long sleeve top which will keep you warm whilst also wicking away sweat to keep you comfortable. Features include a handy chest pocket and reflective zip and trim so you can be seen in lower light levels. Another essential piece of kit is a paddle cap. This will give you sun protection and keep you cool on the hot days, whilst providing warmth and protection from wind chill on those colder outings. Safety should be a top priority when it comes to any sort of water sport. The conditions can be variable and there’s always a chance they’ll take a turn for the worse, no matter how calm it is when you set off. Ensuring you have a high-quality personal flotation device as well as a leash should be the first thing you think about when heading out on the water. PFDs or paddle life vests come in all shapes and sizes but waistbelt versions, such as The Red Original Airbelt PFD, are compact and easy to wear, meaning they won’t hinder movement. But at the end of the day it could save your life, so don’t head out without one. The no.1 question we are asked is what to do with your valuables when out on the water. It’s not the best idea to keep your valuables in cars or lockers just in case items get lost or stolen, and you’ll still need to take your car keys with you. Our answer comes in the form of the Red Original dry pouch, a waterproof pouch that will keep your valuables safe and means you can keep them with you at all times. And what’s more, it also floats! 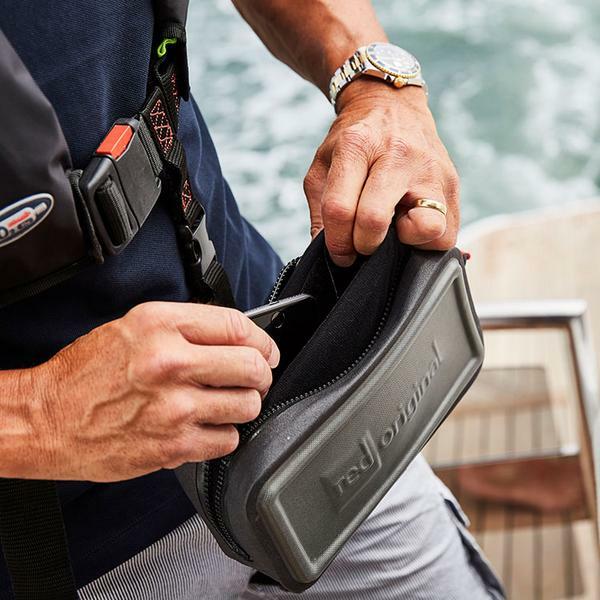 So even if you drop it in the water your valuables are protected, making it ideal for lots of water-based activities – it really is one of most versatile, multi-use products in our range. Your valuables will be kept dry and safe thanks to the high quality, durable and waterproof Armour Tech material, and 100% waterproof YKK zip, plus a high density foam pocket to protect against knocks. And these valuables can, of course, include your phone which is vital to have with you in case of emergencies. Your cool bag and insulated drinks bottle can be used both on and off the water and travel with you anywhere. 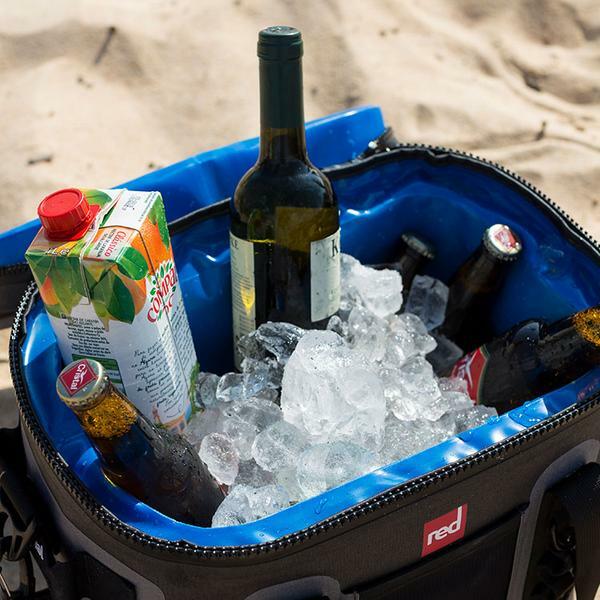 The cool bag can easily attach to a paddle board using the patented LTS system which secures it in place on your deck, whilst the marine grade stainless steel insulated drinks bottle can attach to pretty much anything, meaning you’ll always have a drink to hand. 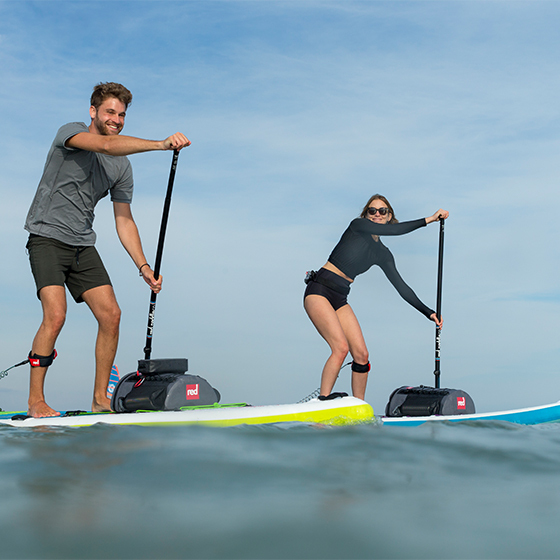 Our bestselling product, our 100% waterproof deck bag, is a great option to take on your SUP adventure. With its 22L capacity, it has bags of room to keep everything you need dry and safe. As with other Red Original products, it is completely water-tight so you don’t have to worry about getting your gear or valuables wet. From a change of clothes, to food, drinks and even a camera for those all-important snaps of the beautiful scenery; having a deck bag you’ll always have everything you need to hand.